Oops! We had a crazy busy weekend and early part of this week so I didn’t get my post written until now! But we are getting dangerously close to the end and I haven’t missed a post yet, so it may be late, but it’s here! Week 36 Recap! Which means I am officially at 37 weeks right now and depending on who you ask that’s pretty much ‘full-term’, which is definitely exciting. I mean, don’t get me wrong, I’d like her to stay cooking in there for at least 2 more weeks, but it is nice to know that if she came out right now she likely wouldn’t have any issues from coming early and would be able to go right home with us. Baby’s Progress: More temperature regulation, brain and lung development are the name of the game for the next 3ish weeks. We will get to have an ultrasound here sometime in the next couple of weeks, so when that happens, I’ll let you know more of how she is doing! Weight Gain: I gained 2 pounds this week… but I gotta tell you… getting on the scale feels somewhat like an unnecessary evil these days, so I don’t do it very often! It’s easy to see how people would gain a lot of weight and not keep track of it during pregnancy! Sleep: Well… Sleep was unbelievably awful this week, but I can’t really blame that on the baby. Our dog, Lexie decided to eat two of my husband’s long black dress socks. So after about 4 or 5 vet visits (where the diagnosis was either HGE, a stomach infection she has had before or anxiety about the baby) she finally passed them in the middle of the night. I’ll spare you all the graphic details, but suffice it to say last week was rough. She wouldn’t eat or drink for 7 days, she wasn’t sleeping well (and so neither was I) and I had more than one emotionally charged (ugh pregnancy hormones) evening where I thought I was going to have to say goodbye to her in my last few weeks of pregnancy. NOT a pretty sight. But, it turns out she just ate my husband’s socks during the storms last week and needed to get that out of her system. So she is now mostly recovered and back to eating and generally being a happy friendly dog. But she definitely took us through some sleep training exercises of cleaning up after her being sick and waking up every few hours. But I’m still hoping to get a week or so of somewhat better sleep before baby girl gets here! Milestones: As far as baby things go, it has been a fairly quiet week! We had a lot going on in our social lives, work and just life in general, but nothing too notable in terms of baby milestones! 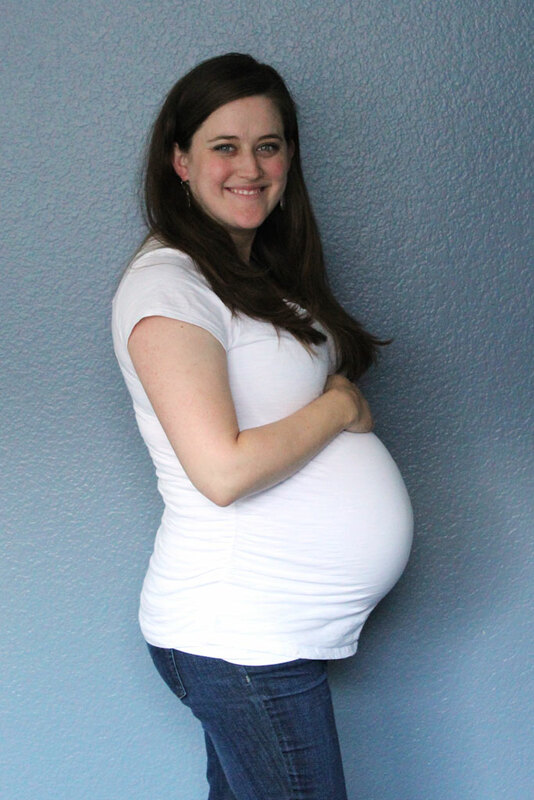 Favorite clothing item of the week: Maternity shorts. They may be the least attractive clothing item I’ve ever seen… I mean they have more fabric above the waistband than below, but since our temperatures pushed up into the upper 90s over the weekend, they were a much needed relief from my jeans!! I ordered these from Gap and then also have a hand me down pair of linen shorts that are UBER comfy from Old Navy. Symptoms: I can definitely feel additional pressure on my body, and turning over in bed is a chore, but other than that I really can’t complain! I do have to put my feet up after a long day, but they haven’t swollen much, they just get tired! Workout: I got to swim laps a few days last week after work and it was glorious! I love being in the water and swimming laps feels much the same as it did before being pregnant, which is a nice feeling!! I also got to walk with a friend on Saturday morning, and spent Monday and Tuesday volunteering at a conference at our church, so I’ve gotten a fair amount of exercise in this week! And although I am tired at night, I feel pretty good, so its encouragement to keep swimming laps and walking (even though I am not doing either strenuously!). Yeah for healthy babies! I can’t wait to meet her! And, poor Lexie. Dogs are silly sometimes.